Tiles 3 can be integrated with spring framework version 3.2. In this example I am using spring version 3.2.7. The complete source for this example is available at github. In this example, I build a simple web application using tiles to build a template where I put a header, a footer, a menu and the pages bodies. I will create two pages : home and about. Here the only relevant part for our example is the servlet and servlet-mapping configuration. Specifying “/” as url-pattern tells the server that my appServlet is the default servlet. If no other servlet can serve the request, appServlet will be called. I do this since springMVC can efficiently handle dynamic as well as static content. A template named “defaultTemplate” will be configured in tiles-definitions.xml. 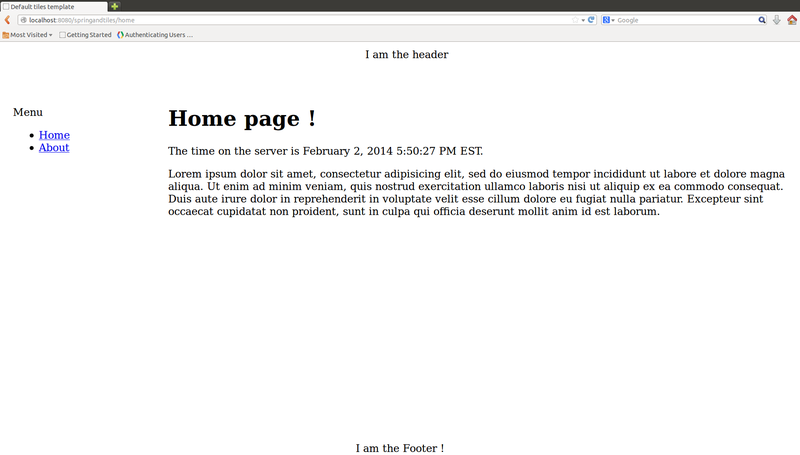 It will be composed of a header, a menu (on the left) and a footer. The body is not yet defined because it will change on every pages. Since this is a view of my application, I put this file in /WEB-INF/views. This page tells tiles that it will use the “defaultTemplate”, and defines directly the page. * Handles requests for the application about page. That’s all for this example, hope it will be useful for you. Thank you for this tutorial, I have a question, how if for example in the about page you have a form to submit and the result is another page ? Thanks brother, I appreciate your help. hi, your configuration looks different because you are still using InternalResourceViewResolver. However, it works and I like it. any comments on this type of configuration? I looked in that: the InternalResourceViewResolver subclasses TilesView. FYI. Thanks for the tutorial :) just one thing, where’s should I put the root-content.xml file? is it necessary? “Boring” yet very easy to understand. Such a good article. Thanks! Thank you Thank Thank you! I am learning the Spring MVC and your example of invaluable help in setting up an example project.